Throughout the summer Evertonians have feared the departure of two of their best players, the two players who most influence the Blues play both in attack and in defence. With the season kicking off it appeared that Everton had fended off any interest in Leighton Baines and Marouane Fellaini, only for news to break of an insulting offer of £28 million for the pair, from current Champions, Manchester United. Quite rightly that offer was quickly rebuffed by Eveton, dismissed out of hand, with the Blues going public with their disappointment and anger. Roberto Martinez chose to go public, hastily arranging an open training session to demonstrate to the watching media that the two players at the centre of the story were happy to continue at Everton, their levels of professionalism firmly intact, as Baines and Fellaini tackled training with gusto and with a smile on their face. If they are attracted by the opportunity of a move to Manchester United, and most players would be, they did not display any noticeable sign of disappointment. Roberto Matinez’ opportunistic use of the media went a step further as he informed the watching press that clubs should stop wasting their time, with offers for his top players. Quite simply put, he is not interested in selling (or not at that price anyway). A closer look at the opening game of the season demonstrates still further why Everton are reluctant to sell their two most prized assets and probably explains why David Moyes is so keen to be re-united with his two former chargers. The first graphic summarise the influence each player had on the game. The bigger the name, the more involved they were, both defensively and offensively. The positioning of their name on the diagram is used to indicate where on the pitch they were able to exert their influence the most. Everton dominated a game they probably should have won and it is no surprise that messes Baines and Fellaini were the most involved on proceedings throughout the 90 minutes. 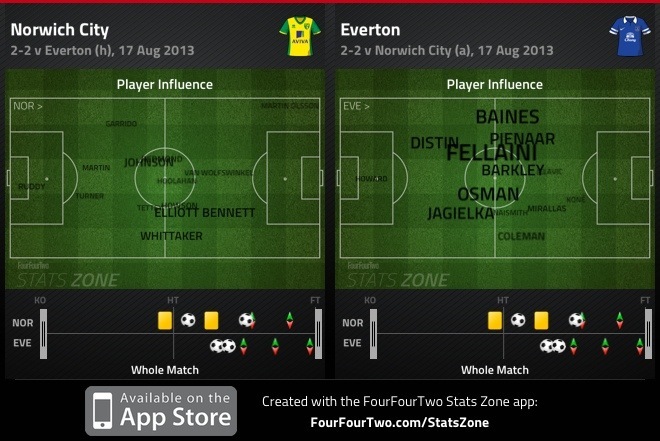 The television pundits have often spoken of the tremendous and almost telepathic link up play between Baines and Pienaar and while this remains true, it has been interesting to see the increasing connection between the centre of Everton’s midfield and the full backs since Martinez took charge. 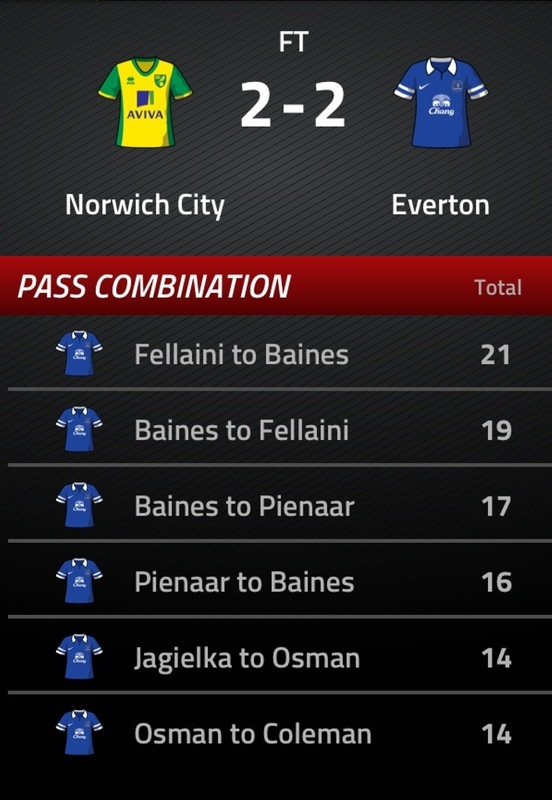 During the game with Norwich, it was actually Baines and Fellaini who linked up more than any other players, putting the Baines-Pienaar combination into third and fourth place. 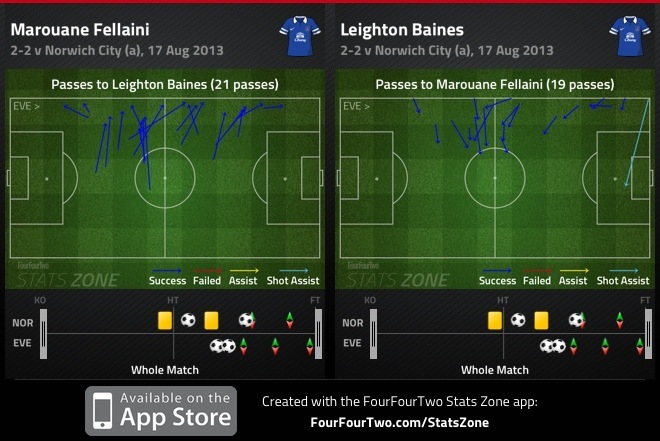 Now it could be argued that the Baines-Pienaar link up happens much further up the pitch and in more dangerous areas. This is of course the case, but with Martinez favouring a more possession based approach, the ability to retain the ball is crucial if the tactic is to be successful. The graphic below confirms that the majority of exchanges between the pair occurs on or around the halfway line, but it is the balls further forward that are the crux of the Martinez approach. As we have touched on previously in other articles, the quick interchanging in midfield allows for space to be created out wide, with Everton looking to spread the ball quickly to the wide men. It is these passes that are crucial to Everton’s success this season and it is for this reason and those above that Everton cannot afford to let their two most influential players leave the club this summer. The Blues need to remain strong. Martinez has played the game brilliantly so far, tackling the situation with a refreshing and open approach, always appearing with a smile and in the process reassuring Evertonians that he has the situation firmly under control. It is going to take a mind blowing offer to force the Blues to sell and although Martinez is thought to have a plan B ready to action, any move will need to be quick to ensure Everton are able to re-strengthen. 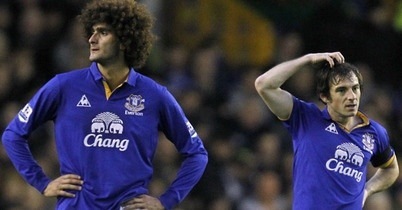 £35m is not enough for Baines & Fellani. In the current market any less than £30m for the Fella would be crazy.